Hello! I'm back to share a few more of my projects for the January Papertrey Ink Release that I didn't have ready for the countdown! All of the products I'm showing today are available in the store at Papertrey Ink. My first card uses the beautiful new Gathered Garden stamps. I decided to try a monotone color scheme for this one. I put a piece of painter's tape across my card about 2/3 of the way up, then blended some Aqua Mist ink above it. With the painter's tape still in place, I stamped the greenery and flowers in Aqua Mist, Hawaiian Shores, and Tropical Teal. The sentiment was stamped in True Black. 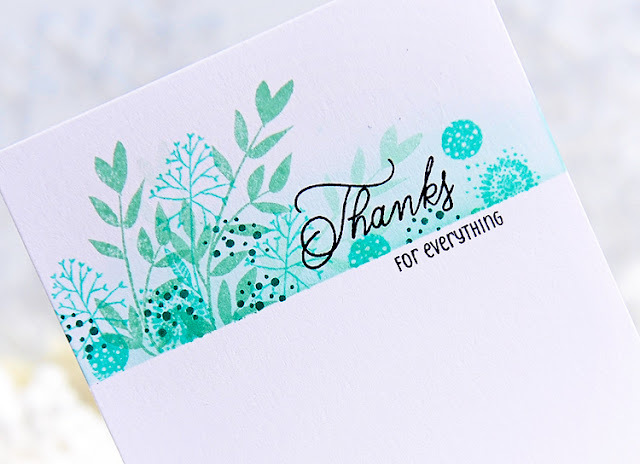 For this card I used the new Cornered Dies, along with Forget Me Not stamps and Grand Botanical Dies. The background is Soft Stone. For the Cornered Die, I cut it out with Stamper's Select White card stock, but left all of the pieces in. I then colored those with a light pink Copic marker to match the flowers. I glued this down, but left the top loose so I could stick the flowers and leaves in along the top edge. I added a few tiny white dots with acrylic paint. 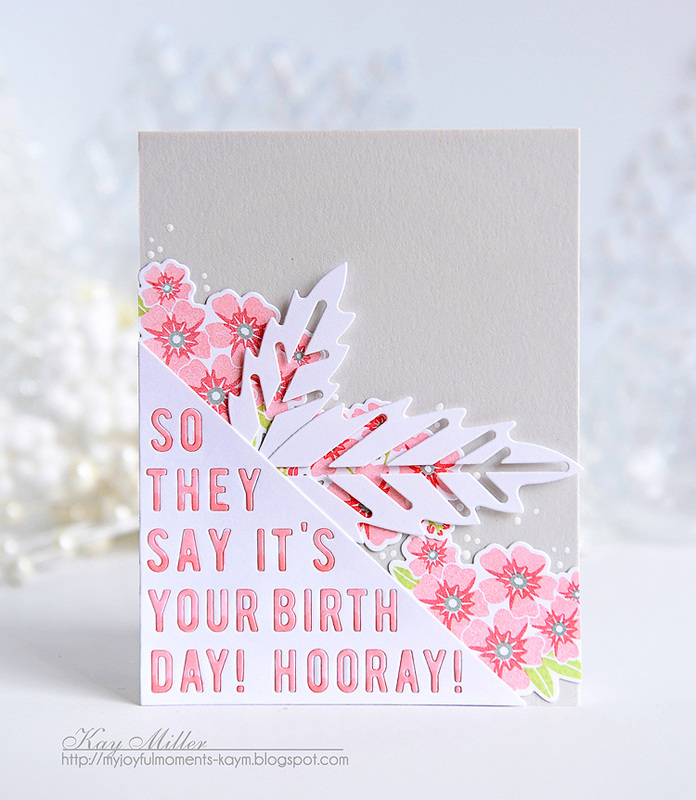 This card uses the new Latin Motifs stamp set along with Outlined. 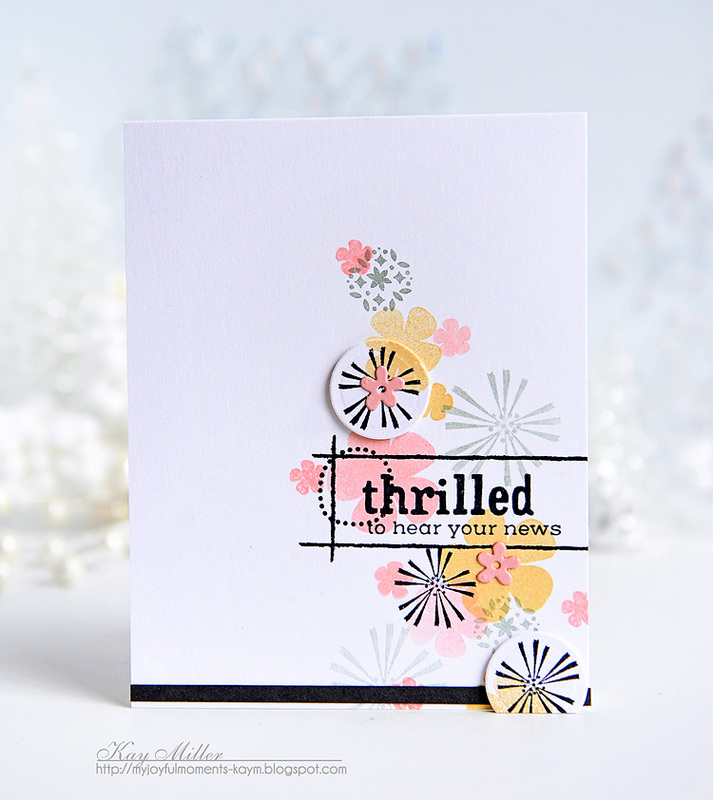 I just randomly stamped the flowers and burst, stamped the outlined shape for the sentiment and then the sentient. I added a small line of Smokey Shadow card stock to the botton edge. I also added the small pink flowers from the Grand Botanical Dies. For this one, I used dies from the new Grand Botanical Dies and some of the greenery from Palm Prints. I first stamped the greenery from Palm Prints in the top right corner, then cut the dies out and adhered them. I stamped the sentiment from Keep It Simple: Retirement in Olive Twist. I hope that if you purchased any of these fun new products that this has give you a bit more inspiration to get them out and start playing! 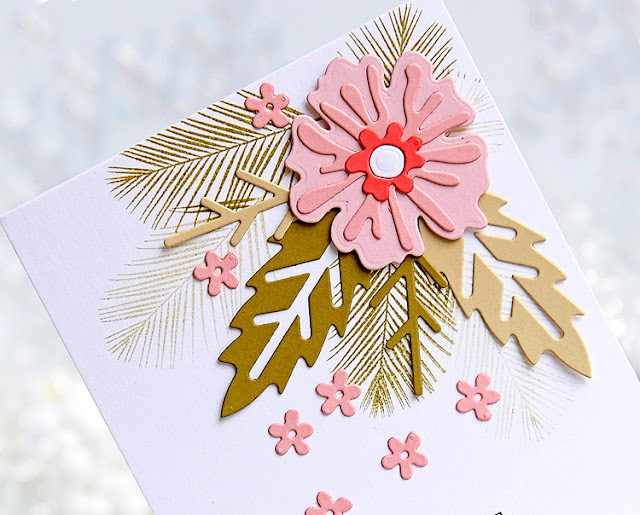 These cards are all gorgeous, Kay! The first one is my fave, though. Oh My Gosh Kay! 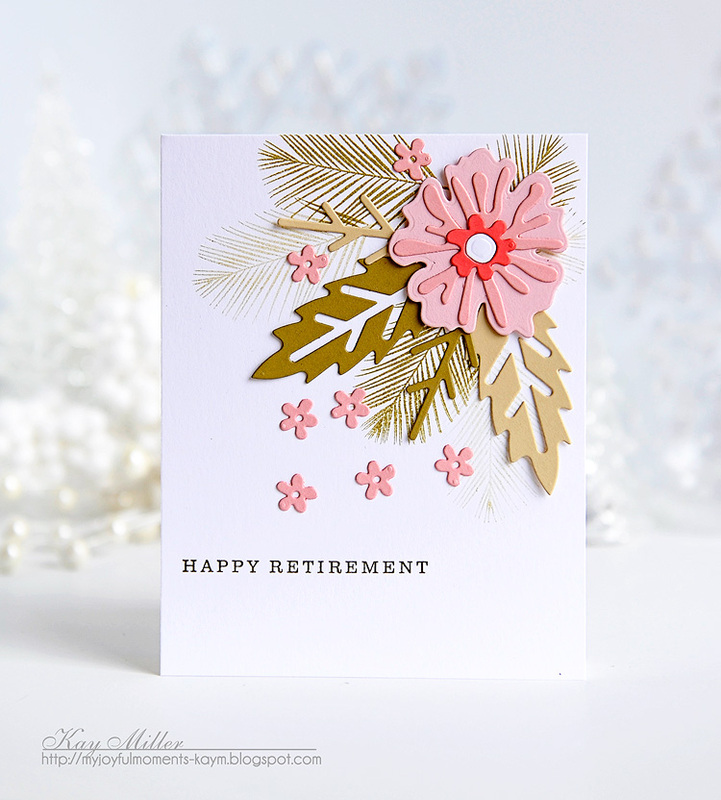 Love these cards, but the Retirement one is over the top beautiful! Wow, what beautiful cards! The designs and soft color combo are so lovely. Love them all, Kay! Each one so beautiful, I think the last one is my favorite! You make me want them all! Ditto what Tracey said; you make me see so many possibilities in these sets. You have such an eye for beauty plus magic fingers to put it all together so perfectly. The corner is brilliant and the colours on the last one divine. Happy sigh. Amazing cards, Kay and yes I agree with Tracey. You are always an inspiration and help me think outside the box...You know the WWJD? well I do: WWKD? (what would Kay do?) Yes, that is how I think! Beautiful cards...thanks for the enabling!! *wink!! Great cards ~ I especially like the first one! These are all so pretty, Kay, you always inspire me!!! 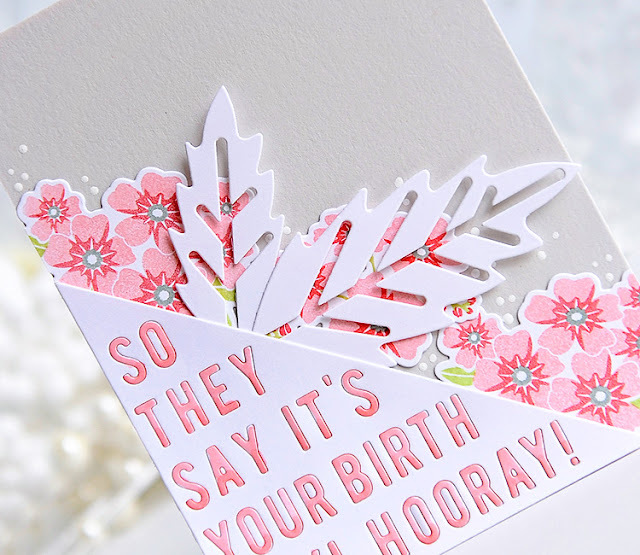 Kay, I couldn't agree more with Tracey's comment about how you do bring out unique ways to use the Papertrey products. Each and every on is gorgeous but since I ordered the Gathered Garden st, that one is my favorite! Fabulous cards, Kay!! All unique and so lovely! So interesting with the various designs! What a delight to see your awesome cards today! Thanks so much for the inspiration!! 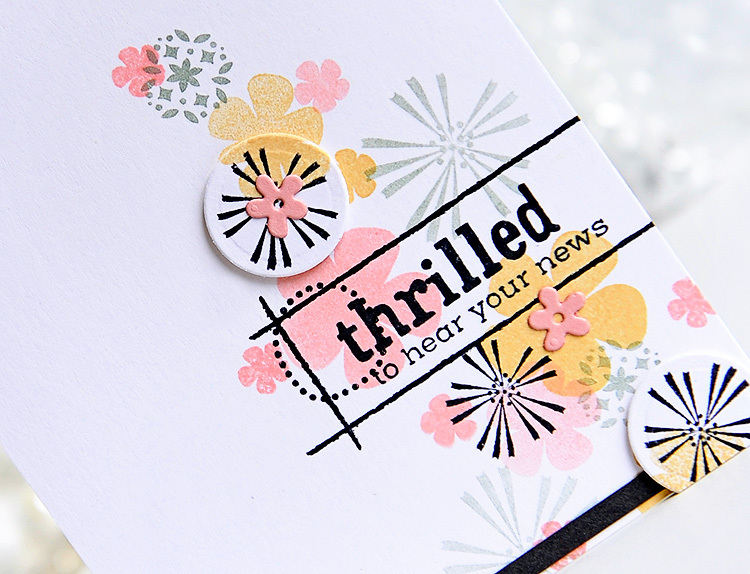 You and Papertrey stamps go together like peanut butter and jelly!! You do such amazing thing with their products. These are all so pretty. I especially like what you did with the Latin Motifs! Kay, you make me want every set! These are all gorgeous, and favorites today! Gorgeous inspiration! Fabulous work, Kay! I don't own any of these sets…yet, but you make me want them all. You are such an inspiration and each and every card you make is delightful. I'm so inspired! My goodness, Kay...every one of your cards are absolutely GORGEOUS! Of course my fave is your first one...I love that it's one layer, monochromatic and a mix of flowers and leaves! Honestly, you have such a great eye for color and design, and always know how to bring your images to life! Thanks for being a bright spot in my day!!! Oh, my, Kay. These cards are fabulous. There is something about each one that is intriguing, whether it's color choice or simplicity or use of product. I'm surprised that I especially like the Latin Motifs card. It is so different from what I'm usually drawn to, but I just love the way you used the black to ground the design. I have to give that a try. Thank you for the inspiration. Every single one of these is gorgeous. I love the first one and am going to try that monochromatic look. And the third card, with Latin Motifs, made my jaw drop. Everything about it is drawing me in. Thank you for the inspiration! Each of these cards is a masterpiece. I don't have the stamp sets you used but I have the paper and inks and so many other PTI stamps that will work. You are a great inspiration. Wish I wasn't at work right now - I want to stamp! I think the Thrilled card is my favorite because it's a little funky. Beautiful cards, Kay. I am in awe of your forget me not card. I usually don't go for the dies with the hard angles but you made it soft and feminine. LOVE it!